It’s the Thursday before April’s Patch Tuesday, and Microsoft’s Advance Notice has gone live. There are nine bulletins this month, affecting all versions of Windows, some Office and server components and also Windows Defender on Windows 8 and RT. However only two bulletins are rated “critical”. Bulletin 1 is for all versions of Internet Explorer (IE), including the newest IE 10 on Windows 8 and RT, and should be on the top of your patching efforts. It is rated “critical” and allows Remote Code Execution through today’s most common attack vector: one of your users browsing to a malicious website. Bulletin 2 is the second vulnerability, rated “critical”, and affects the Windows Operating System, except the newest versions, WIndows 8, Server 2012 and Windows RT (the tablet version). The remaining bulletins are all rated “important” and affect Windows, the Sharepoint server, — and interestingly a security product — Microsoft’s malware scanner, Windows Defender on Windows 8 and Windows RT. The vulnerabilities addressed in these bulletins typically allow the attacker Escalation of Privilege from a normal user to an admin level user once they are already on the machine or can trick the user to open a specifically-crafted file. In other important news, the PostGreSQL Open Source project has published a new version of its database product that addresses five security flaws. One of them, CVE-2013-1899 allows the attacker to delete database files without authentication, leading to data loss and denial of service, and they considered it important enough to warrant last week a pre-announcement of the upcoming release expected this week. Please keep also in mind that Oracle has scheduled an extra release for Java this month. Normally Java is on a four-month release cycle: February, June and October of each year. Due to the amount and severity of recent vulnerabilities discovered, there will be an additional release that will go live on April 16th. Google and Mozilla patched their browsers within 24 hours of the receipt of the vulnerabilities found through PWN2OWN . It is the beginning of March and Microsoft just published the Advance Notice for this month’s Patch Tuesday. We will get seven bulletins next week, affecting all versions of Windows, some Office components and also Mac OS X, through Silverlight and Office. Four of the bulletins carry the highest severity rating of “critical”. Bulletin 1 will be on the top of our list next week. It fixes critical vulnerabilities that could be used for machine takeover in all versions of Internet Explorer from 6 to 10, on all platforms including Windows 8 and Windows RT. Bulletin 2 addresses critical vulnerabilities in Microsoft Silverlight, both on Windows and Mac OS X, and is widely installed at least on end-user workstations to run media applications, for example Netflix. Bulletin 3 is a vulnerability in Visio and the Microsoft Office Filter Pack. It is puzzling to see such a high rating for this software that typically requires opening of an infected file in order for the attack to work. It will be interesting to see the attack vector for this vulnerability that warrants the “critical” rating. The last critical bulletin is for Sharepoint server. The three remaining bulletins are all rated “important” and apply to OneNote, Office 2010 for Mac and Windows itself. In other security news, the ZDI’s PWN2OWN competition is currently going on at the CanSecWest security conference in Vancouver. PWN2OWN awards prizes ranging from US$ 20,000 to US$ 100,000 to security researchers who can demonstrate vulnerabilities in the following products: Adobe Flash, Adobe Reader, Google Chrome, Microsoft Internet Explorer, Mozilla Firefox, Oracle Java. In yesterday’s run, prizes have been claimed for Oracle Java by James Forshaw, Oracle Java again by Joshua Drake, IE10 on Windows 8 by VUPEN, Google Chrome on Windows 7 by a team from MWR Labs, John and Nils and finally Mozilla Firefox and finally Oracle Java, both by the team at VUPEN. Today the competition continues with attacks on Adobe Reader, Adobe Flash and IE10, and is then followed by Google’s Pwnium3, which awards prizes of over US$ 100,000 for vulnerabilities in Google’s ChromeOS. You can expect patches for these vulnerabilities to be released over the coming weeks. We will keep you updated here, so stay tuned. A new QID “120832 – Oracle Java SE Critical Patch Update – February 2013” has been released and you can use QualysGuard VM to scan your network to find the systems that require the patch. In the October 2011 Patch Tuesday, Microsoft released update MS11-077 to fix a null pointer de-reference vulnerability (CVE-2011-1985). In this paper, we will reverse engineer the patch for MS11-077 (CVE-2011-1985) to get a better understanding of the vulnerability fixed by this patch. 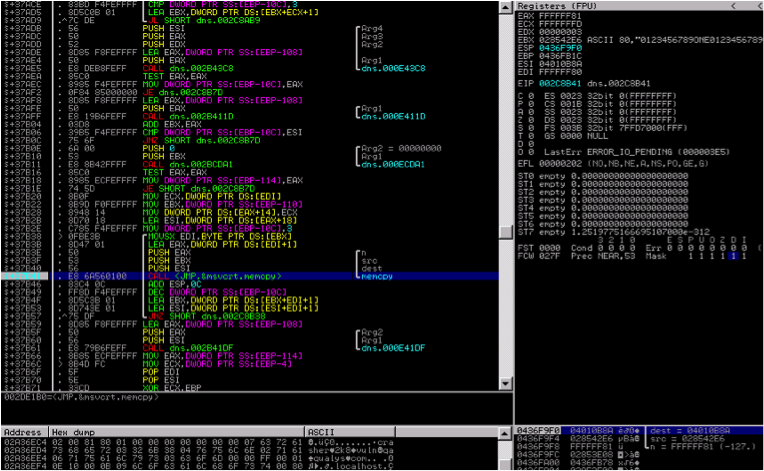 Using binary diff, we can see the changes that were made to the vulnerable file win32k.sys. Figure 1 below shows the TurboDiff results. As you can see in Figure 1 above, while most of the functions are identical, there are a couple of functions that look ‘suspicious’ and some others that are ‘changed’. The large number of changes is not a surprise because Microsoft has fixed four different vulnerabilities with this patch. Taking a closer look at all the functions that were changed, you will see that the changes made to functions ‘NtUserfnINLBOXSTRING’, ‘NtUserfnSENTDDEMSG’ and ‘NtUserfnINCBOXSTRING’ are all the same. Figure 2, below shows the changes made. Figure 2: Binary Diff for function NtUserfnINLBOXSTRING(x,x,x,x,x). Looking at the binary difference, it is clear that the patch is checking that the arg_0 (first argument passed to the function) is 0xFFFFFFFF and if it is 0xFFFFFFFF, call _UserSetLastError() with 0x578 and return from the function. This gives us two pointers to exploit the vulnerability. The first is that the arg_0 has to be 0xFFFFFFFF. The second pointer is that the patched function bails out setting system error code to 0x578. This is the system error code for ERROR_INVALID_WINDOW_HANDLE, thus hinting us that the argument is of type HWND. Everything until now is pretty simple and it looks easy to exploit this vulnerability. However, the really challenge here is finding a user mode function that will call the vulnerable function. It turns out this isn’t very straightforward, and we will need to understand the Windows GUI subsystem. The GDI (Graphics Device Interface) APIs are implemented in the GDI32.DLL and include all the low-level graphics services such as drawing lines, displaying BMPs etc. The GDI APIs make system calls into the WIN32k.sys to implement most APIs. The User APIs are implemented in USER32.DLL module and include all higher-level GUI-related services such as window management, menus, dialog boxes, user controls etc. USER heavily relies on GDI to do its work. One of the most important means of communication in Windows is Messages. Windows-based applications are event-driven and act upon messages sent to them. The way you program in Windows is by responding to events. These events are called Messages. Messages can signal many events, caused by the user, the operating system, or another program. Each window, owned by a thread, has a window procedure (function) for processing input messages and dispatching them to the operating system. 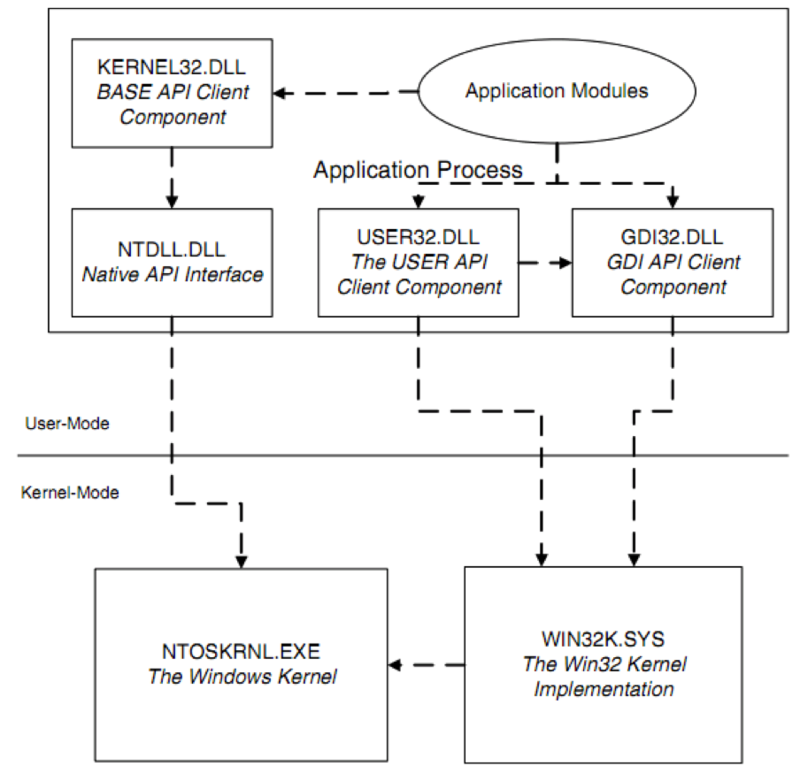 If a thread accesses any of the user interface or GDI system calls (handled by win32k.sys), the kernel creates a THREADINFO structure which holds three message queues used to process input. These are the input queue, the post queue, and the send queue. The input queue is primarily used for mouse and keyboard messages, while the send and post queues are used for synchronous (send) and asynchronous (post) window messages respectively. Asynchronous messages are used in one-way communication between window threads and are typically used to notify a window to perform a specific task. Asynchronous messages are handled by the PostMessage APIs and are sent to the post queue of the receiving thread. The sender does not wait for the processing to complete in the receiving thread and thus returns immediately. Synchronous messages differ from asynchronous messages as the sender typically waits for a response to be provided or a timeout to occur before continuing execution. Thus, they require mechanisms to ensure that the threads are properly synchronized and in the expected state. Synchronous messages use the SendMessage APIs which in turn directs execution to the NtUserMessageCall system call in win32k.sys. This information is enough for us to take our analysis further. As described above, the message mechanism plays an integral role in the user interface component of the Windows operating system. There are many different types of message codes and those less than 0x400 are reserved by operating system. Depending upon the type of message code, NtUserMessageCall() calls a particular function to handle the message. 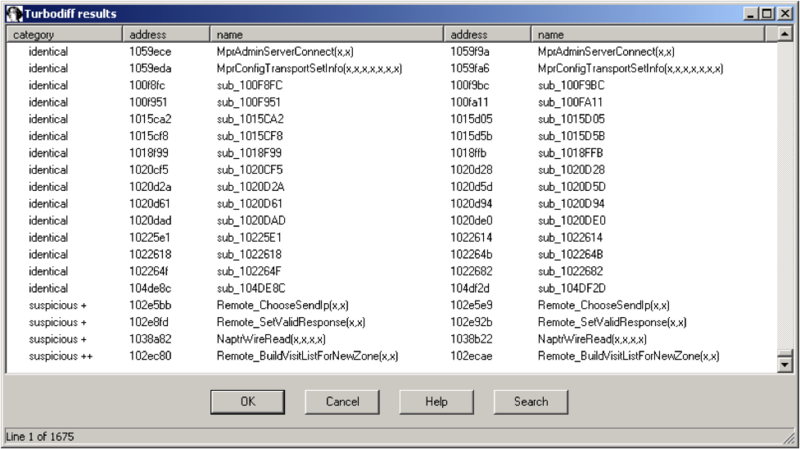 Let’s take a closer look at how NtUserMessageCall, calls the appropriate functions to handle different message types. As seen in the above figure, the function first checks if the Msg code is less than 0x400(EAX has the Msg code) to check if it’s a system message code. Each Message code denotes an index in the win32k!MessageTable byte array. This byte value is than logically AND to 0x3F, since the last 6bits of the byte obtained from win32k!MessageTable determines the function that will handle the Message code. _gapfnMessageCall is a function table that stores address of all the functions that can handle different messages. See Figures below to see how _gapfnMessageCall table looks. Thus if we can get the index of our vulnerable function in _gapfnMessageCall, we can easily compute how we can call the vulnerable function. The index of our vulnerable functions are 29(0x1D), 27(0x27) and 43(0x2B) for NtUserfnINLBOXSTRING(),NtUserfnINCBOXSTRING() and NtUserfnSENTDDEMSG() respectively. if MessageTable[i] & 0x3F == 0x1D //NtUserfnINLBOXSTRING() Hit! if MessageTable[i] & 0x3F == 0x1B //NtUserfnINCBOXSTRING() Hit! if MessageTable[i] & 0x3F == 0x2B //NtUserfnSENTDDEMSG() Hit! As we’ve seen above, it is pretty easy to trigger this vulnerability. We would recommend our customers to scan their environment for QID 90746 and apply this security update as soon as possible. In the Patch Tuesday for August 2011, Microsoft released Security Bulletin MS11-058 (CVE-2011-1966) to fix a unauthenticated remote code execution vulnerability in DNS servers. According to the security advisory, a remote code execution vulnerability exists because the Windows DNS Server improperly handles a specially crafted NAPTR query string in memory. An attacker who successfully exploited this vulnerability could run arbitrary code in the context of the system. 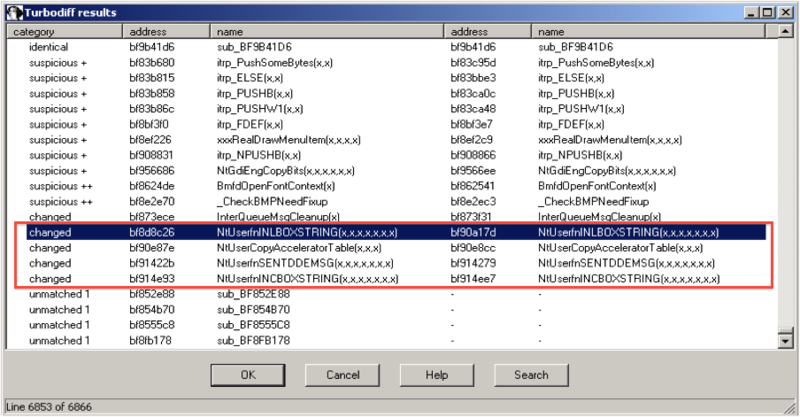 We reverse engineered the patch to get a better understanding of the mechanism of the vulnerability and found this vulnerability can be triggered with a few easy steps. While the proof of concept described below demonstrates a denial of service, attackers with malicious intent may be able to get reliable code execution. QualysGuard detects this vulnerability with QID: 90726 – Microsoft Windows DNS Server Remote Code Execution Vulnerability (MS11-058). Because of the possibility of a code execution attack, Qualys recommends all our customers to scan their environment for QID 90726 and apply this security update as soon as possible. We start the analysis by binary-diffing the unpatched and the patched version of the files that were made available by the MS11-058 security update. This helps us understand the changes that were made in order to fix the vulnerabilities by this patch. 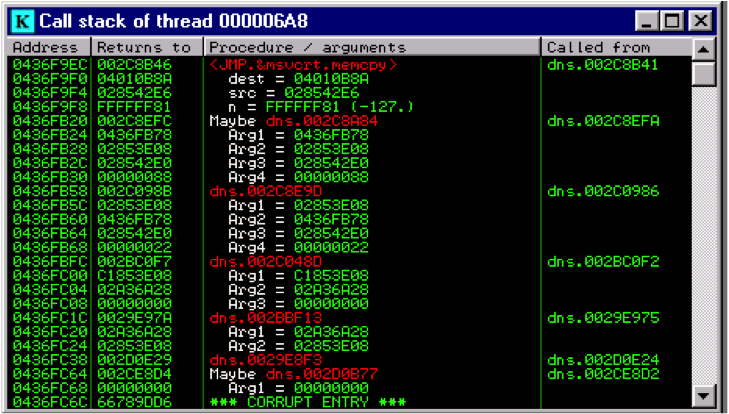 To perform binary diffing we use TurboDiff, which is a plugin for IDA pro. TurboDiff shows us a list of all the functions that are identical, changed, unmatched and those that look suspicious. Suspicious functions have unchanged function graphs but changed checksums, which indicates a small code change was made. While most of the functions look identical, TurboDiff lists some of these functions as suspicious (Fig. 1). Figure 1: Diffing results by TurboDiff. As seen in figure 1, TurboDiff lists four of these functions as suspicious. The vulnerability we are investigating is related to CVE-2011-1966, which is related to Name Authority Pointer (NAPTR) DNS resource record. From the names of the four functions marked as suspicious, it is pretty clear the ‘NaptrWireRead(x,x,x,x)’ has something to do with the NAPTR DNS record and this should be the first function to analyze further. Taking a closer look at the diffing results for the function NaptrWireRead(x,x,x,x) reveals there is only one change made to the entire function (Figure 2, indicated with green box). The signed extended instruction “movsx edi, byte ptr[ebx]” is replaced with zero extended instruction “movzx edi, byte ptr[ebx]”. This value is then further used as the number of bytes to copy from the source buffer to the destination buffer for memcpy(). The signed extended move instruction is a trouble maker here. If the byte pointed by “byte ptr[ebx]” is greater than 127(0x7F), the resulting value in the edi register will be a very large number. For example if byte pointed by [ebx] is 128, the resulting value in register edi will be 0xFFFFFF80. The next instruction “LEA EAX, DWORD PTR DS:[EDI+1]” will load EAX with 0XFFFFFF81 which is used as a count for memcpy(). This example will try to copy the entire 4Gb of memory, leading the DNS service to crash. Figure 2: Binary Diff for function NaptrWireRead(x,x,x,x). For the proof of concept, you need two DNS servers. 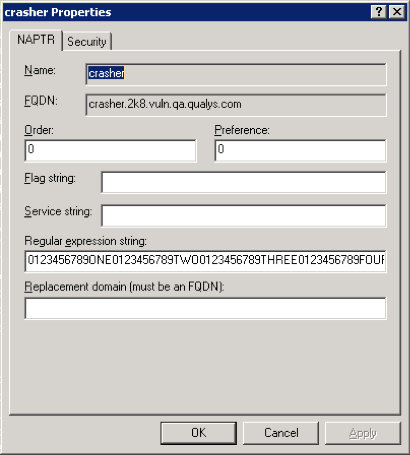 Register the domain crasher.test.com on the first server and configure a NAPTR DNS record as shown in figure 3 below. The second DNS server will act as a forwarder DNS server. Of all the fields shown, the “Service String” and “Regular Expression” fields are the ones that can take input greater than 127 characters with no restrictions. To exploit this vulnerability we make any of the above mentioned fields have more than 128 characters. In this case we set the "regular expression" field to 128 characters. From the forwarder DNS, type the command “nslookup -type=all crasher.test.com. 127.0.0.1”. This command will crash the DNS server working as the forwarder. Figure 3: DNS NAPTR form. To see the vulnerability in action, attach your debugger to the DNS executable and set a break point at the NaptrWireRead(x,x,x,x) function and also set a breakpoint at the memcpy() function in that function. Figure 4: BreakPoint at memcpy() in NaptrWireRead(). From Figure 4 (see the values passed on the stack when calling memcpy()), it is clear that setting the value greater than 128 has caused the count parameter for memcpy function to be a really large value causing an access violation and crashing the DNS server. The call Stack Trace for the above vulnerability can be seen in Figure 5 below. Figure 5: Call Stack Trace. To analyse the crash via windbg, you can start Windbg with the command “windbg -I” an register it as a default postmortem debugger. When you run the “nslookup -type=all crasher.test.com. 127.0.0.1” again, the DNS server crashes and windbg starts for analysis. Figure 6 shows the output of the !exploitable crasher analyzer. Figure 6: !exploitable plugin output. As shown in the analysis above, this vulnerability can be triggered with a few easy steps. While this PoC demonstrates a denial of service, attackers with malicious intent may be able to get reliable code execution. Hence we recommend all our customers to scan their environment for QID 90726 and apply this security update as soon as possible.